MODOC, S.C. (Oct. 9) — Capitalizing on a tangle of two frontrunners, Wendell Chavous of Hephzibah, Ga., led the final 10 laps Saturday at Modoc Speedway for a victory in the second round of the Fastrak Grand Nationals. Polesitter Jonathan Davenport of Blairsville, Ga., was in command in the first 40 laps, but Royce Bray of Hull, Ga., tangled with Davenport on a late restart, allowing Chavous to slip around both drivers to take a lead he'd never give up. David Smith of Inman, S.C., ended up second followed by Shanon Buckingham of Morristown, Tenn., last year's Grand Nationals overall winner. Anthony Sanders of Spartanburg, S.C., and Kenny Peeples Jr. of Rural Retreat, Va., rounded out the top five. Davenport was 12th and Bray 22nd. The final round of the Grand Nationals is scheduled for Oct. 22-23 at Wythe Raceway in Rural Retreat, Va., where the overall winner collects $30,000. 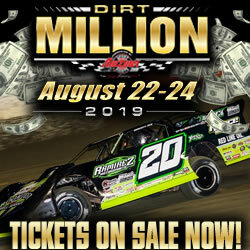 Fastrak Grand Nationals: (1) Wendell Chavous, (2) David Smith, (3) Shanon Buckingham, (4) Anthony Sanders, (5) Kenny Peeples Jr., (6) John Henderson, (7) Owen Osteen, (8) Lee Cooper, (9) Brandon Umberger, (10) Chris Cantrell, (11) Albert Cosnahan, (12) Jonathan Davenport, (13) Dan Breuer, (14) Frankie Beard, (15) Blake Bentley, (16) Danny Sanders, (17) Brian Connor, (18) Parker Herring, (19) Ty Lowe, (20) Travis Blackwell, (21) Brandon Overton, (22) Royce Bray, (23) Eric Veal, (24) David Watts. Fast qualifier (among 32 cars): Davenport, 17.283 seconds. Heat race winners: Davenport, Chavous, Bray, Smith. Consolation winners: Herring, Breuer.